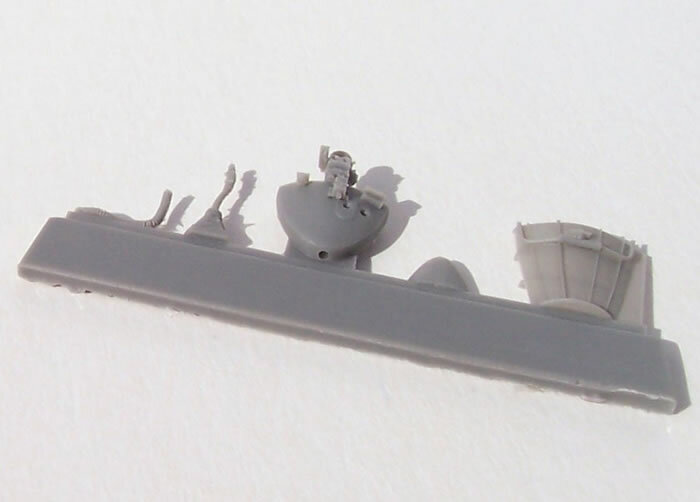 Cockpit interior set and canopy (for Hasegawa kit). Available on-line from Hannants for £11.23 and Modelimex for €10.42. 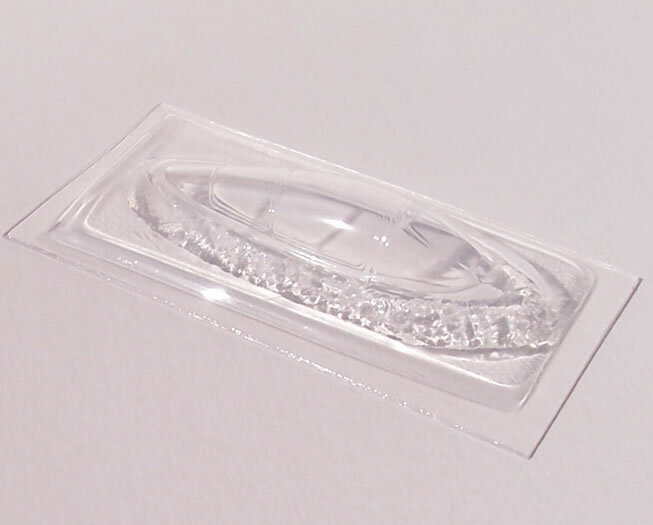 Highly detailed, resin cast to the highest standards, multi-media. An excellent complement to the Hasegawa F9F-8 Cougar kit. Highly recommended. Resin Art is a relatively new brand from the Czech Republic. 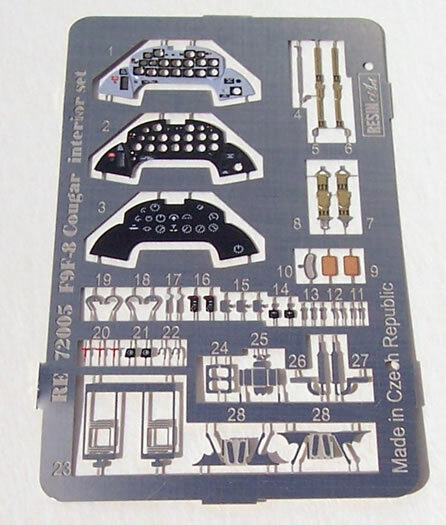 They produce sophisticated detail sets in the most popular aircraft scales. 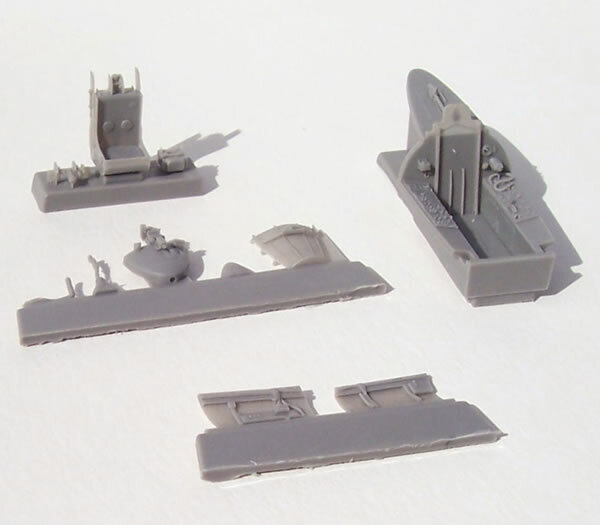 I’m pleased to see that several of their releases are to 1/72 and aimed at some slightly older kits in need of a lift, such as the set reviewed here is intended for. 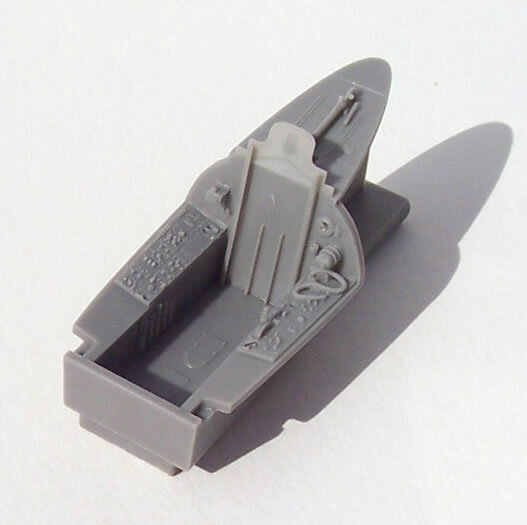 The set is intended for the Hasegawa F9F-8, which is a good kit, but with unsophisticated cockpit detail reflecting its age (this kit has also been boxed by Minicraft). 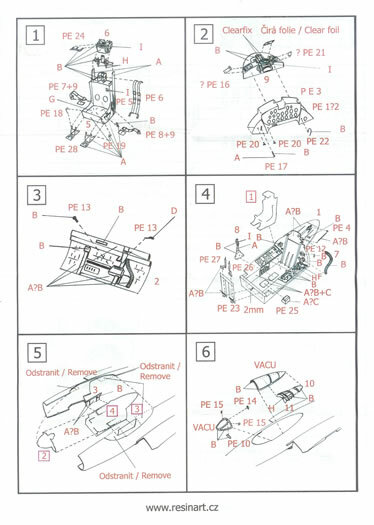 The parts come in a vac-form blister pack with self-evident diagrammatic instructions and notes in English and Czech. Colour call-outs are for Agama, Humbrol, Model Master and Mr Color paint brands. The parts themselves are crisply cast in a grey resin on easily removed fine casting blocks. Detail levels and finesse are to the highest standards. The pre-coloured PE fret is excellent, and caters for the different interior colours used by aircraft in overall blue or later grey/white schemes. The vac-form canopy is flawless. 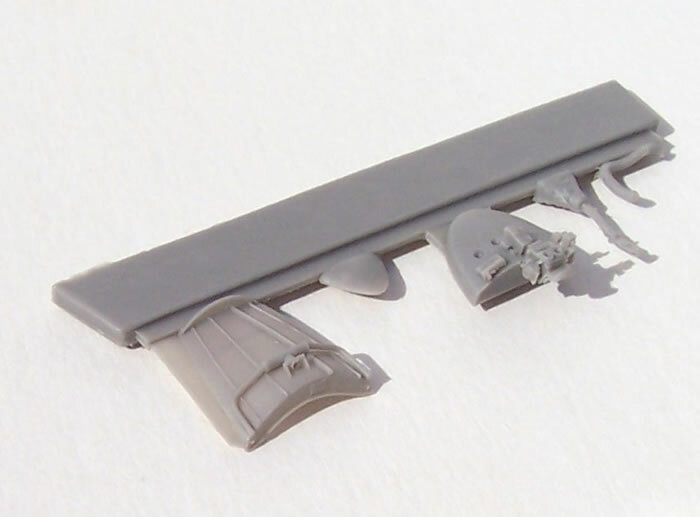 The finesse of the parts is stunning, and offer levels of detail usually associated with larger scales (just take a look at the gun-sight in the accompanying images). 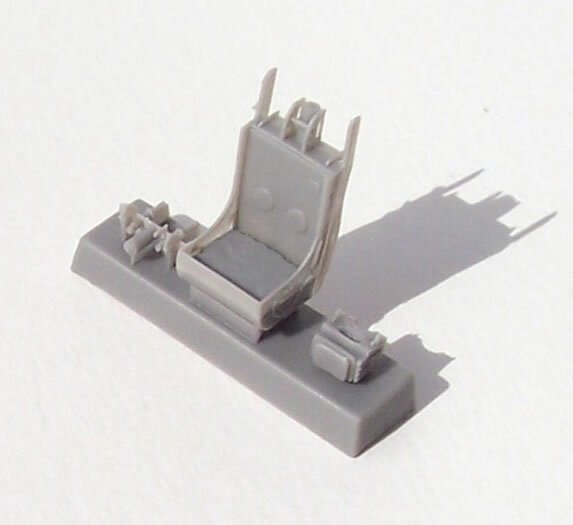 The resin ejection seat is dressed up with seat belts from the pre-coloured PE fret. I usually like my belts cast with the resin seat in this scale. However having recently completed seats for a CMR kit using the same system I can advise that the finished result is very nice. I expect the Cougar seat to look very good too. The set is rounded out by a very well formed canopy, and the level of internal detail just begs that this be displayed in the open position. 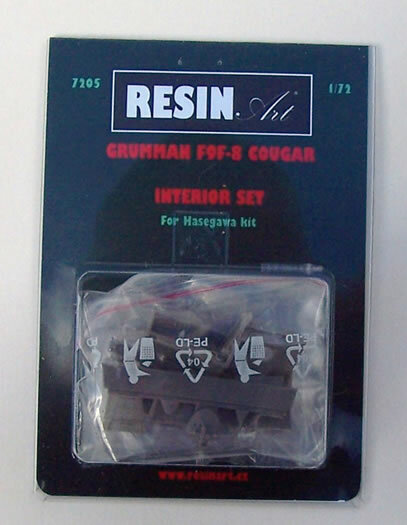 Although not reviewed here, Resin Art also make replacement nose & wheel set for the Hasegawa Cougar as well. 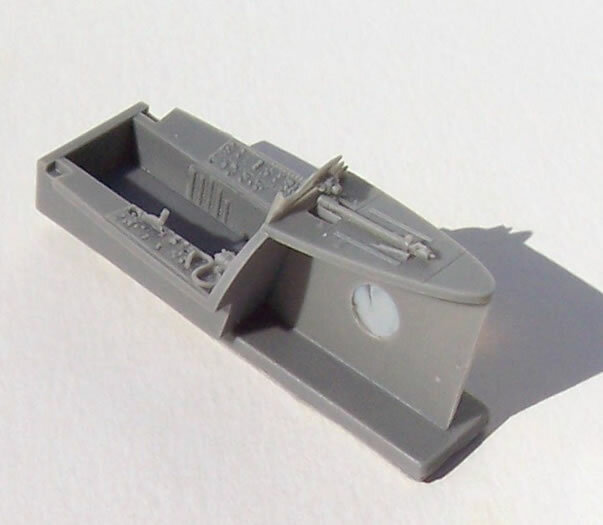 This is a superb cockpit detail set, one of the best in 1/72 I have seen in a while. 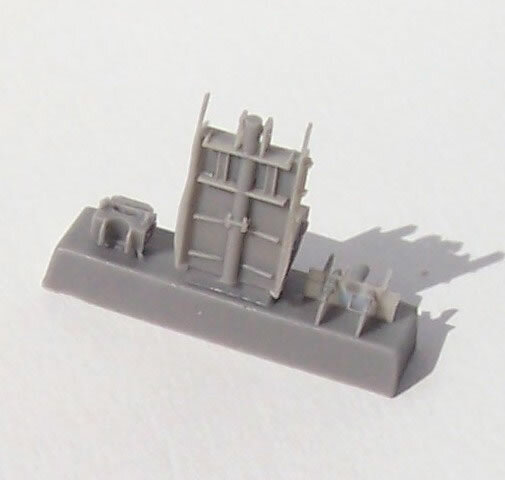 It will really lift your Hasegawa/Minicraft F9F-8 Cougar model - Highly recommended.